World Storytelling Day is a unique celebration, that is observed around the world on the spring equinox in the northern hemisphere and on the fall equinox in the southern hemisphere. 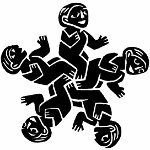 World Storytelling Day origins in Sweden, when the first storytelling event was organized in 1991-1992. This celebration was called Alla berättares dag (All storytellers day). The Swedish national storytelling network passed out, but the event stayed alive and it was celebrated by the enthusiasts across the country. The event started to spread around the world, when Western Australia coordinated a five-week-long Celebration of Story in 1997. At the same time Mexico and number of Latin states started celebration of National Day of Storytellers. World Storytelling Day spread around the world, and in 2009 it was celebrated in Europe, Africa, Asia, Americas and Australia. Annual celebration has a theme and it's agreed upon by storytellers from around the world. Every participant of the event tells and listens to stories in as many languages and places as possible.